Amarnath Cave: The Amarnath caves are one of the most famous shrines in Hinduism, dedicated to the god Shiva, located in the Indian state of Jammu and Kashmir. 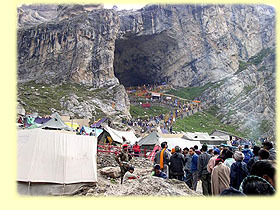 The cave is situated at an altitude of 3,888 m, about 141 km from Srinagar, the capital of Jammu and Kashmir. The Central Reserve Police Force, Indian Army and Indian Paramilitary Forces maintain a strong presence in the region due to security concerns. 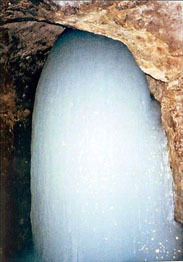 Amarnath is an ice Silva-linga, that changes size with the seasons, and also as the moon waxes and wanes it becomes bigger and smaller. On the full moon day the linga is about 6 ft high. There is famous Rigvedic Verse that says "Ekam Sat" that is "There is one Being ,the sages call Him by many names." The God (Parmeshwar) has three deities who carry on the world .This is Known as Holy Trinity. Brahma- the creator, Vishnu - the perpetuator of life and Shiva (Mahesh) - the purifier and perpetuator of good and destroyer of evil. Rig Veda refer Shiva as Rudra as in its following verse. "We Worship Tryambaka (Rudra), Who spread Fragrance and Increases Nourishment, May He release me ,like the cucumber from its stem , From Mortal Life , But not From Immorality . "(Rig Veda Mandal VII Sukta 59 and Mantra 12). Duration: 02 Nights and 03 Days. Arrive at Srinagar Airport. Meet and greet by our airport representative. 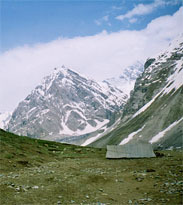 Transfer to Sonmarg. On arrival check-in at Hotel. Rest of the day free to relax or visit Thajewas Glacier. Overnight stay in Sonmarg. Early morning transfer to from Sonmarg to Baltal. Departure for the Panjtarni by Helicopter from Baltal Helipad. The Helicopter start operating at 06.00 Hrs (Weather Peremiting). Panjtarni is approx 3.5 Kms from Holy Cave, you can go there by Foot or can hire Palki/Pony at your own cost. After darshan return back to panjtarni to board helicopter to Baltal. On return you will be met by our driver. Transfer by vehicle from Baltal to Srinagar. On arrival check-in at Hotel / Houseboat. Dinner and Overnight stay at Srinagar. ● 01 Vehicle for all the services as per above program. ● Return journey by Helicopter to the Holy Cave from Baltal. ● 1 Night stay at Sonmarg on Room Only Basis. ● 1 Night stay at Srinagar with breakfast & dinner. ● If the Helicopter does not operate due to bad weather, technical or any other unforeseen reasons, we will not be responsible for any financial loss that may be incurred by the passengers due to this. The Helicopter operator may offer the passengers an option to travel the next day. In such cases the passengers would have to pay Rs. 1000 for the vehicle retention for 1 extra night and will also have to pay for their hotel accommodation for extra night. 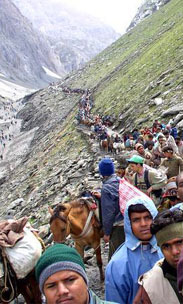 Alternately the passengers may make their own arrangement for the stay in Sonmarg. In case the passenger is unable to perform the Helicopter journey due to the above mentioned reasons, they are entitled to full refund for the airfare only. ● The Helicopter travel is subject to all the terms and conditions mentioned on the Helicopter ticket. Passengers are requested to read them carefully. ● At the time of booking we require following details. ● Full Name and Gender of all passanger. ● Full address and phone no. of all families. ● Details of ID card and No. that would be carried by the passenger in whose name booking is being made. ● Following documents are accepted as valid Photo IDs: Valid Passport/Driving License/Election Card/Pan Card/Photo Id issued by Govt./PSU and School Photo ID.